Sometimes, when you live with a bear, that bear has to work late. One such occurrence happened on Valentine’s Day, so our Valentine’s Day feast was postponed a week. But then we went all out. Oh yes we did. 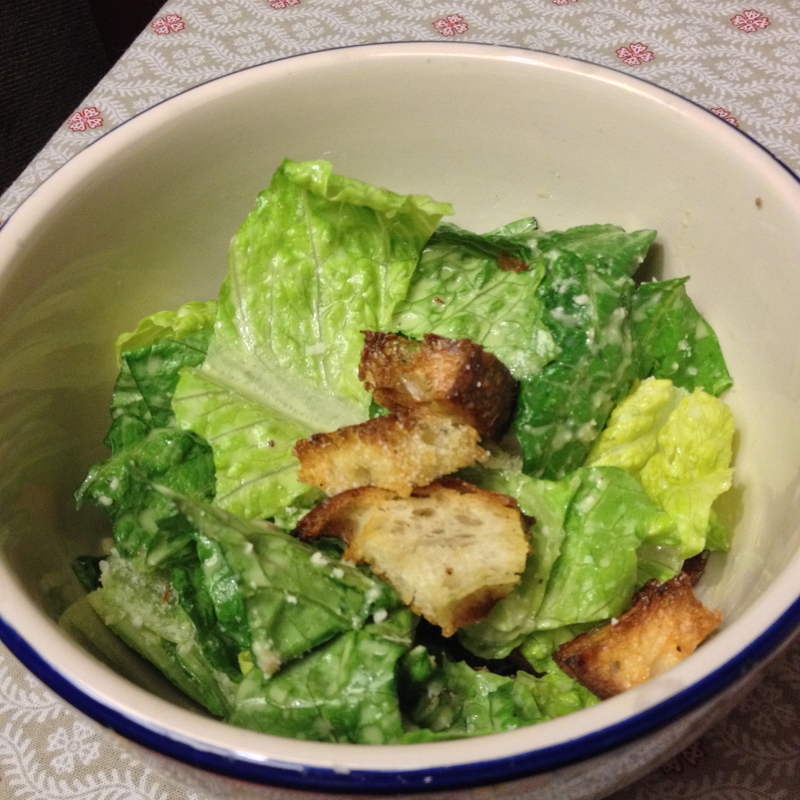 For the first course, I made the Caesar Salad for Two. Now, if you are like me, you have probably never made Caesar dressing at home. Maybe the anchovies scared you off. Maybe it was the raw egg. Either way, it’s a daunting proposition. I decided to give it a try anyhow (because someone had to) and let me just say, you should ignore all of your fears and hesitations regarding this and just make it for heaven’s sake! It’s so good!! The bear was so thrilled with it that he literally made me make it three more times in the following week. It tastes neither fishy, nor eggy. It tastes like what comes out of a bottle only 100 times more flavorful and delicious. Do it! The good thing about this recipe is that it is a small batch too, just enough to make a decent size bowl of salad for two maybe three people. I’m not sure how well homemade caesar would store in the fridge so this recipe is ideal. 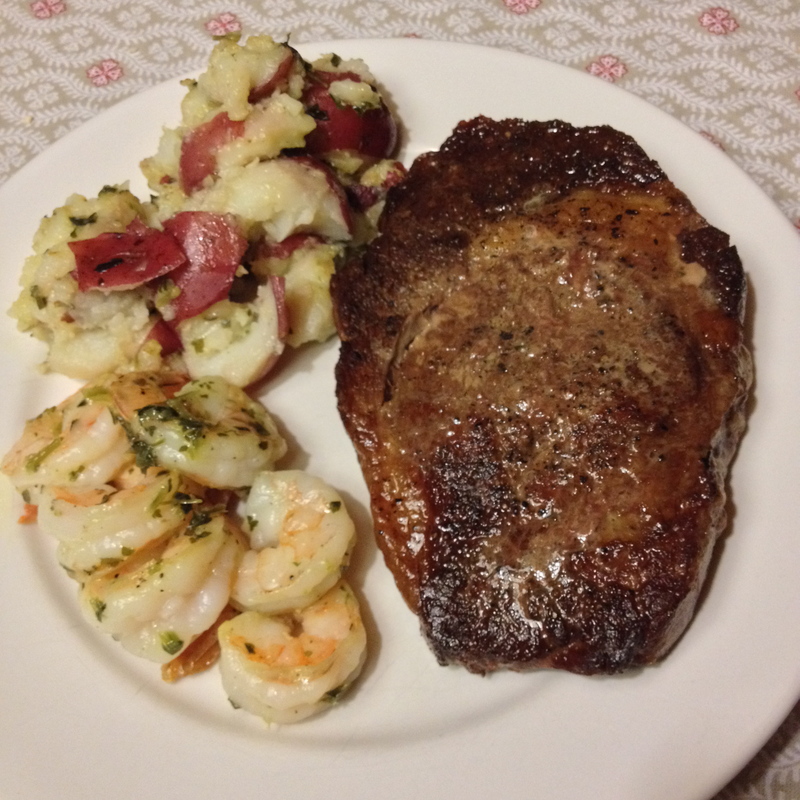 We followed our salad with Steak and Shrimp with Parsley Potatoes. Well really, the steak was for the Bear, and the shrimp were for me. I did try the steak (the first steak I ever cooked) and I thought it was quite tasty. It wasn’t too beefy just tasted nice and seared and salty. (I tried to replicate it with a different cut of meat and again it was too beefy). The shrimp were cooked perfectly. They were sweet and buttery. 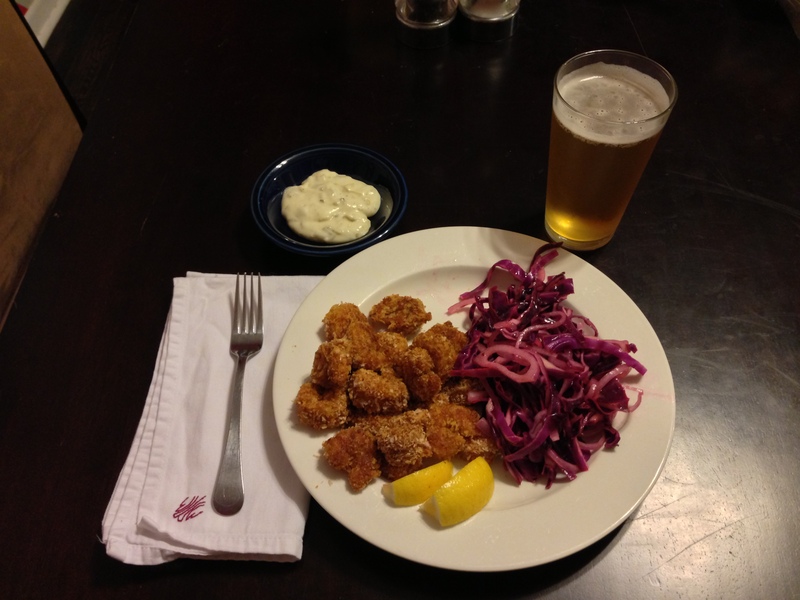 I think scallops would also be good in this recipe. The potatoes were also quite tasty. They were buttery and the perfect little side for the decadent shrimp and steak. And finally… oh yes, the Fresh Orange and Yogurt Tart. 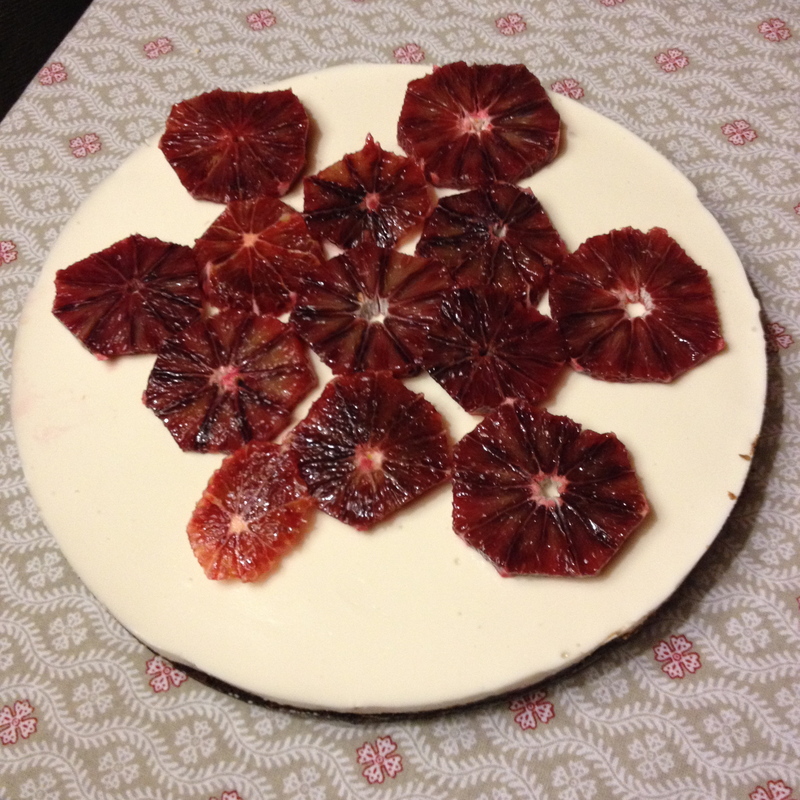 Navel oranges are for chumps so I used blood oranges. This was an awesome desert folks. Just spectacular. After such a decadent meal this wasn’t so over the top sweet that we would instantly fall into a food coma. Nope it was light and satisfying. It was an amazing texture and I will absolutely make some variation of this again. I think it might be pretty awesome to make the yogurt part and then top it with a curd, maybe like that incredible orange curd I made for the pavlova. So there you have it, a feast to end all feasts. A feast to end the Jan/Feb 2010 issue. Next up, March 2009!! 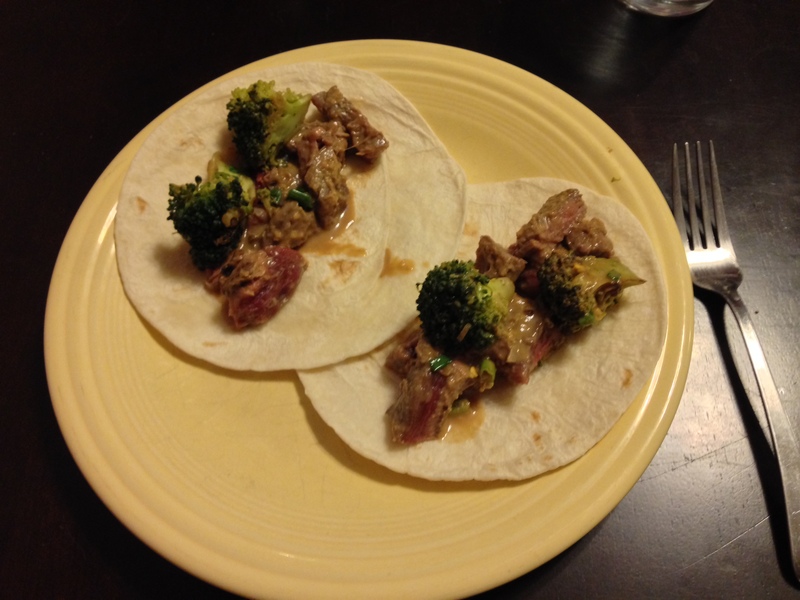 This was the recipe that used the leftovers from the notorious steak of the bazillion peppercorns. So the key to these sandwiches was definitely to pick off the peppercorns. Once that’s done, everything else is pretty straightforward. 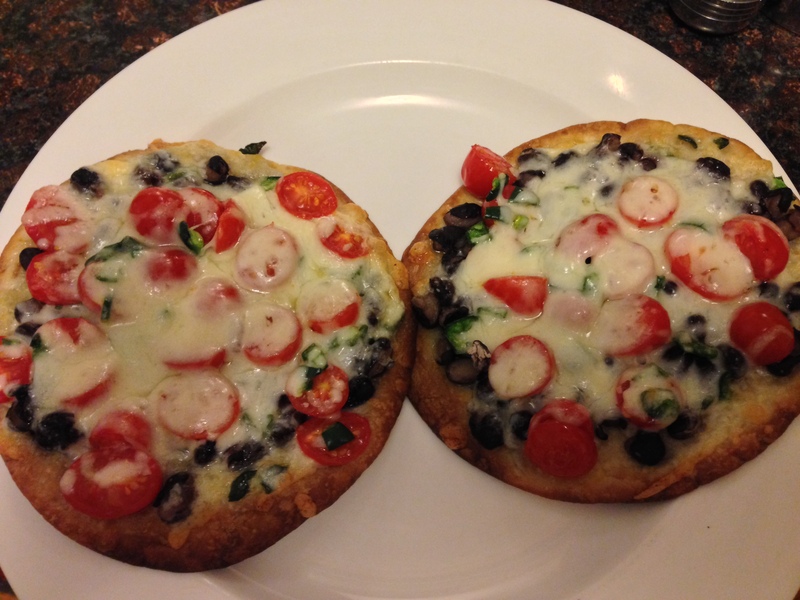 I made these on some of those little “sandwich thin” things, because I sent D to the store with a grocery list that said “flatbread.” These are, indeed, flat pieces of bread. D acknowledges that it was a mistake. But the sandwich thins are good! And sometimes wraps are a mess. 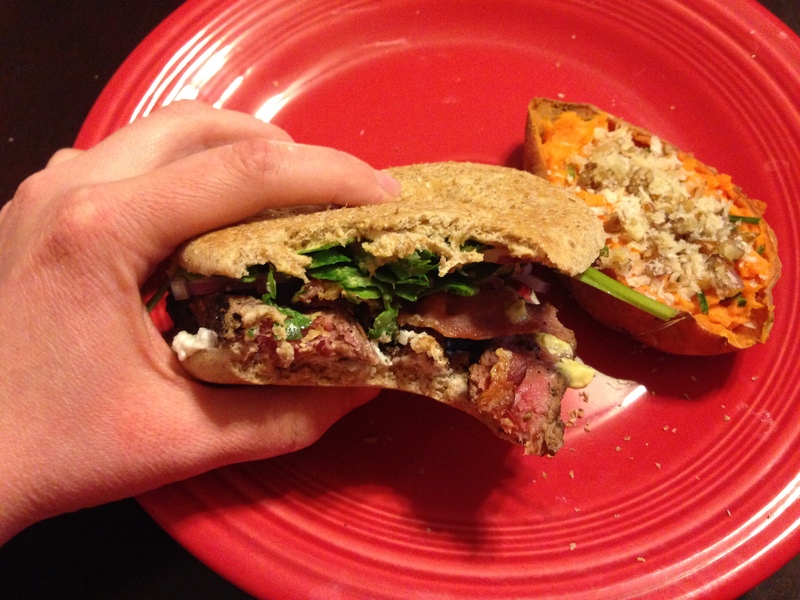 This is mostly just a straight-ahead steak sandwich with the exception of that yogurt spread. It’s low-fat Greek yogurt and Parmesan cheese in equal parts. This spread should be on all sandwiches. It’s so good. It’s got the creaminess and tang of mayo (close enough) with the saltiness of cheese. I’d eat this spread on crackers. I’d dip carrots in it. Suffice it to say, I’d recommend it. 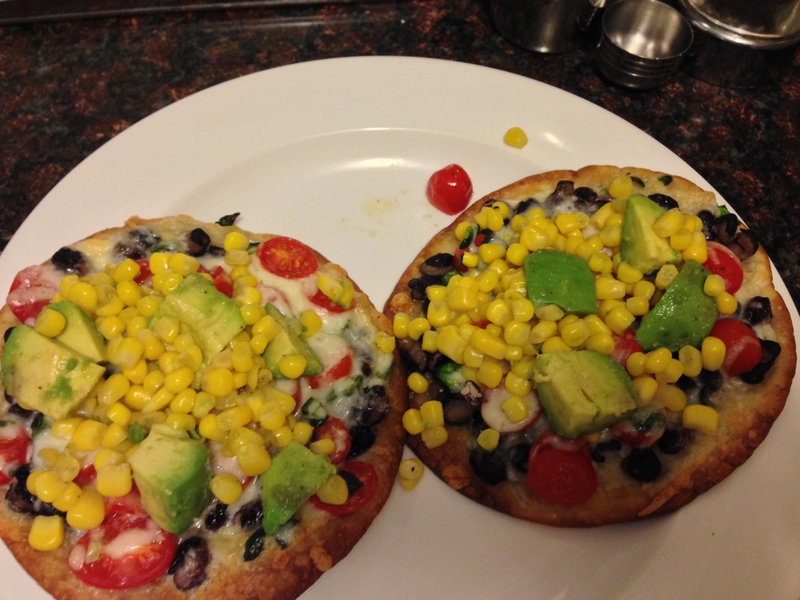 UPDATE: This is the first post of a brand new month of Everyday Food. B and G got together a few months ago and painstakingly chose an issue for December. I’m not being sarcastic. Pains were taken. It was very hard to choose. We settled on December 2011. Without even realizing it, that was the month when B and her bear visited me and D! There’s clearly something special about that month. It’s hard to believe we’ve already made it through three whole issues. D made the steaks, so a lot of this is second hand. There’s one thing we both figured out: There is too much pepper called for in this recipe! D loves pepper and even he was picking peppercorns off of his steak. You could use 1/4 of a cup of crushed black pepper and have more than enough. Also, this is a job for a spice grinder (or a spare coffee grinder that you keep for this purpose) not your kitchen pepper mill. I started trying to grind all of the pepper with a pepper mill and D stopped me. I would probably still be grinding that pepper right now. Can you even imagine how long it would take to grind 3/4 c of pepper? Anyway, use the spice grinder and only grind 1/4 c. It will be plenty. The sauce is heavenly. I kept finding excuses to eat more of that sauce. The fact that there was too much pepper on it just encouraged me to eat more sauce! Wine, cream, mustard, steak drippings… the gang’s all here. Ah, but there’s a twist. We didn’t have any white wine on hand. I told D that we could substitute dry vermouth like B did. D wanted to experiment and try Lillet instead. B asked me (and I definitely had to look this up) what Lillet is. She thought it was maybe a fortified wine. Welp, the series of tubes tells me it’s a “tonic wine” containing a blend of wines and mostly citrus liqueurs. Now we know. I made the sweet potatoes, and I’ve been dreaming about them ever since. The recipe is amazing just as written. The goat cheese adds the perfect amount of tang to cut the sweetness of the potato and the richness of the butter. Add in those sharp chives, and you’ve got a nicely balanced side. I really like the panko crumb and pecan topping. All in all, I’ll be making this one again. I think you could make it all ahead of time right up until the top the refilled potato and bake step. Just make the topping right before you need it to keep the panko crumbs from getting soggy. Oh, another note about making the sweet potatoes. 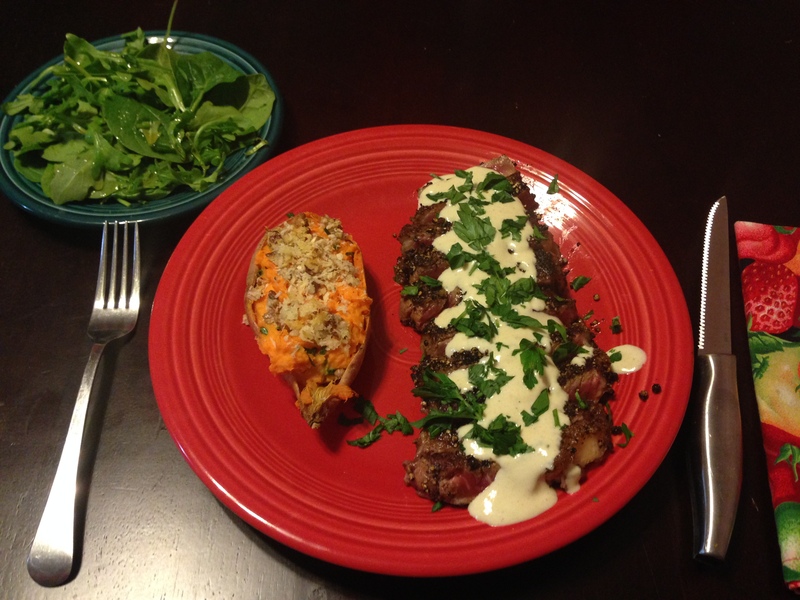 The recipe has you using a food processor to mix together the baked sweet potato (mine were microwaved, by the by), goat cheese, and butter. That seemed wholly unnecessary to me. Just leave the goat cheese and butter sitting out while you microwave the sweet potatoes and do other prep. Between that little amount of softening and the heat of the potatoes, your arm can do the trick. On the other hand, I have these insane mom-guns ever since I had a baby… I still think the food processor is overkill, though. J seemed to like the sweet potato the first time he ate it, but turned his nose up at it the second time. “Oh no!” said his mother, “I guess I’ll just have to eat it!” And, thus, G sat and ate a twice-baked sweet potato with a baby spoon. Don’t judge me until you try these potatoes. 2 bunches arugula, thick stems removed. or 10 oz of baby arugula and ignore the stems! Heat a large skillet over medium-heat. Season the steaks with Montreal Steak Seasoning (yeah, Martha calls for salt and pepper….sucker). Place in skillet, and cook until medium rare, 5-6 minutes per side. Transfer to a cutting board and tent with foil. Hang on to that skillet. Add cauliflower, garlic, and 1/2 c water to skillet; season with salt and pepper this time. Cooking, tossing occasionally, until cauliflower is browned and crisp-tender, 8-10 minutes. (I didn’t have any problem with the bottom of the pan getting too dry, but the recipe says you can add 1/4 more water). Meanwhile, in a large bowl, whisk together lemon juice and oil; season with lame salt and pepper. Add arugula, hot cauliflower, and Parmesan cheese to dressing in bowl; toss to wilt that arugula. Steak steaks and veggies together. You can garnish it with lemon wedges, if you’ve got them handy. *adapted from Everyday Food Issue #47 page 18 November 2007. Can’t you see it? Yeah, I forgot to take a picture. Probably because it wasn’t all that good, but I won’t blame the recipe. The recipe calls for flat iron steak. Well, I go to a small grocery store and the meat selection is mostly for making Mexican food. 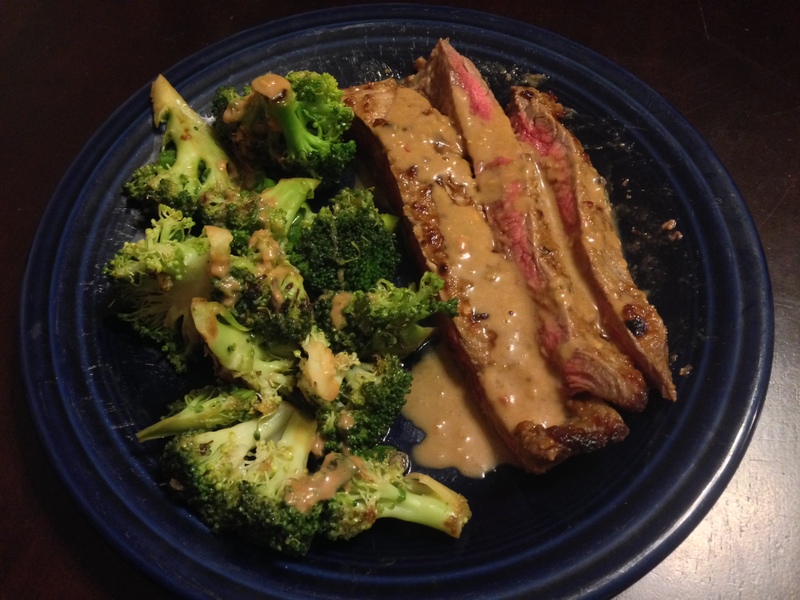 No flat iron steak. I’ll be honest, I don’t really know my cuts of beef anyway. So I bought four boneless hunks of something or other. Round steak? It was pretty terrible. I think it was stew meat. oops. The veggie part was good. It was nice to saute the cauliflower and add it to the arugula to wilt it. Add some shaved Parmesan cheese, and I’m sold. Too bad I wasn’t sold on buying the right steak.